Replacing the windows at your house can be a massive undertaking, but when you partner with Majors Home Improvement in Fort Walton Beach, Florida, the process can be seamless. We are a local, family-owned company that has provided exceptional window installation services in the Panhandle region since 1997. 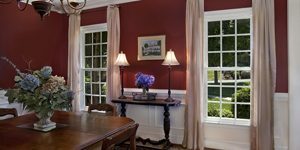 Our Majors Select™ vinyl windows are available in a multitude of styles, including double hung, single hung, picture, bay, casement, and slider, among others. The craftsmen that install our house windows are highly trained and experienced. They also provide Red Carpet Service, which is an internal checklist that they complete to ensure each and every customer we serve is given all-star treatment. This checklist includes being mindful of plants and pets, keeping a clean worksite, and taking off shoes when working in a home. It’s this dedication to service, coupled with the high-quality products we install, that has earned us an A+ rating with the Better Business Bureau and a five-star rating with GuildQuality. If you are in need of new replacement windows for your house in Fort Walton Beach, FL, Let Majors Do It. Contact Majors Home Improvement today to schedule a complimentary consultation.